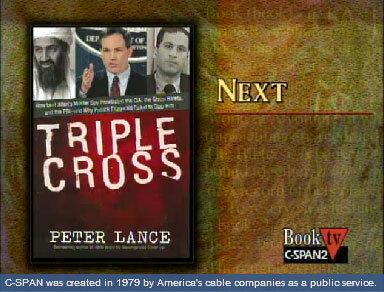 Peter Lance talked about his book, Triple Cross: How bin Laden’s Master Spy Penetrated the CIA, the Green Berets, and the FBI–and Why Patrick Fitzgerald Failed to Stop Him, published by Regan Books. He described what he called the incompetence of the FBI and Justice Department leading up to September 11. In his book the author looks at the infiltration of the CIA and FBI by al Qaeda agent Ali Mohamed. Mr. Lance argued that by posing as an FBI informant, Ali Mohamed was able to lead a double life for nearly two decades. All efforts to stop him, including efforts by prosecutor Patrick Fitzgerald, failed. After his presentation he answered audience members’ questions.